This article will focus on cast iron tea kettles, which are meant to warm or boil water for tea. These kettles can turn you from a tea newbie to a tea aficionado. For the sake of clarity, there is some confusion with the terminology of cast iron tea kettles versus cast iron teapots. A kettle is normally designed for use on the stove to heat or boil water for tea or other purposes, while a teapot is generally used for steeping the tea. Sometimes, cast iron tea kettles can be confused with cast iron teapots. For example, the tetsubin, which is Japanese, was originally used as a kettle to boil and pour hot water, although nowadays people contend that tetsubins also encompass smaller versions that serve as teapots that brew tea. Cast iron kettles are some of the oldest types of kettles in existence. The material, which is obviously cast iron, is preferred by many manufacturers and consumers because it is non-toxic, is able to retain heat well, and can be molded into any number of different shapes. Many buyers of these kettles swear that the water tastes much cleaner and fresher with a slight sweet taste as compared to other tea kettles. Other types of tea kettles can be made from stainless steel, glass, copper, or aluminum. These kettles are almost indestructible, but rust can sometimes be a problem. It is recommended to keep the kettle as dry as possible, and to remove any remaining water after boiling. Over time, the kettle can develop a protective layer of minerals that can help prevent rusting. If it does develop rust, I have read that boiling water inside mixed with baking soda and lemon juice, can fix the issue. You can buy iron tea kettles in many different weights and sizes depending on how many people you normally plan to serve tea. The kettles can also have various designs and colors, even to match the colors in your kitchen. It definitely brings some more class to your tea making, and makes good conversation topics. Another benefit is that you are not limited to using the water just for tea, but you can make hot chocolate or other hot beverages with the warm water. 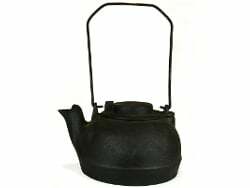 There are not many offered on Amazon.com, but I did find an expensive Japanese Cast Iron Tea Pot Kettle on Amazon . Believe it or not, sears.com offers a wide variety of cast iron tea kettles as opposed to the teapots. Be careful because many cast iron tea kettles sold online are oddly just meant as humidifiers (despite using tea in their descriptions). The price range for these kettles are usually between $20 to $100. There are even antique kettles on other sites that can run into the hundreds of dollars. Remember that there is a big difference between cast iron tea kettles versus cast iron teapots and even certain retailers mistake the two, so make sure to read the description. Many of the online tea stores appear to sell the teapots, but not the tea kettles. You know it is a teapot if they say not to put it on the stove. I hope that this article helps you understand more about cast iron tea kettles, and that it improves your tea drinking experience. These kettles definitely add some class to your kitchen. My husband and I sell cast iron cookware. I recently had a question about cast iron kettles and found your article very helpful. I would like to get your permission to link your site to our site. Lehman’s (Ohio, USA) has a great online catalog, can mail you a paper one, & has some store-fronts (in Ohio). They have a few types of cast iron kettles (for boiling water), some unlined & other lined w/enamel (to prevent rust). I just got an old cast iron teapot from a friend who collects different art and unique things. How can I get it checked out to see how old it is? There are some markings on it hard to read though. I am interested in finding out if the boiled water inside the caste iron kettle will have some iron in as it would if you would cook food in a caste iron skillet. Hi, my understanding is that some of the iron does get into the food or tea. I found an article online with further detail: https://runnersconnect.net/cast-iron-pan-iron/.